Great Fountain Geyser is the best show you'll see in Yellowstone National Park. The name is not hyperbole, it really is a Great Fountain Geyser. Pressure below the earth sends huge pillars of water as high as 220 feet in the air. The water shoots out over random intervals for nearly an hour creating a mesmerizing show where you never know what the geyser will do next. While the water patterns are random, the eruption schedule is predictable. With a little planning, you can see this show in person during your visit to Yellowstone. Location: Great Fountain Geyser is located on the western side of the lower loop of the Grand Loop Road along Firehole Lake Drive. The entrance to Firehole Lake Drive is just south of the parking lot for the Fountain Paint Pots area. Hiking Distance and Time: Other than the distance from your car to the observation area there is no hiking required to see this geyser. However, you may have to wait for a couple hours before the geyser erupts so plan for that. In the summer of 2017 I received a job with Xanterra Parks and Resorts in Yellowstone National Park. I moved there with my husband and our four young children. We lived in a 25 foot RV and spent all our free time exploring the park. 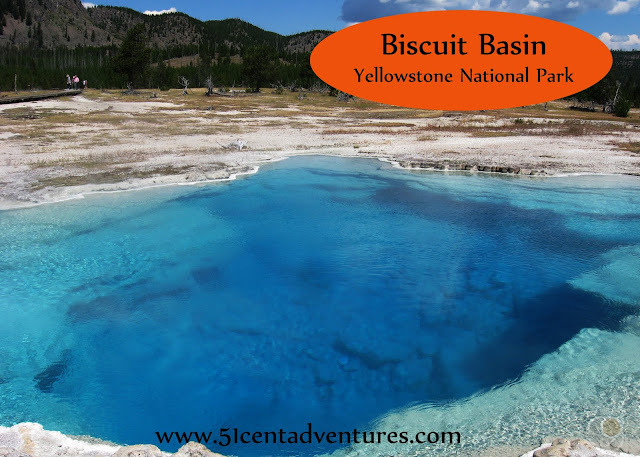 This is the ninth of many posts that I will write about specific features within Yellowstone National Park. At first these aren't going to be in any particular order, but in a few months I'll start grouping them into lists. This one would probably fit into a list such as best geysers in the park. As a general rule I don't recommend waiting around to watch geysers erupt in Yellowstone National Park. Most geyser eruption cycles are so unpredictable that it isn't worth your time to sit in the hot sun waiting for something that may not happen while you are there. However, there are a few geysers that are worth waiting for, and Great Fountain Geyser is one of them. Great Fountain Geyser erupts every 9 to 15 hours and it's eruption times can be predicted based on the length of the last eruption. So that means you can have a pretty good idea of when it's going to go off. The staff at the Old Faithful Visitor Center can help you find out when the last eruption was and the window when you can expect another eruption. 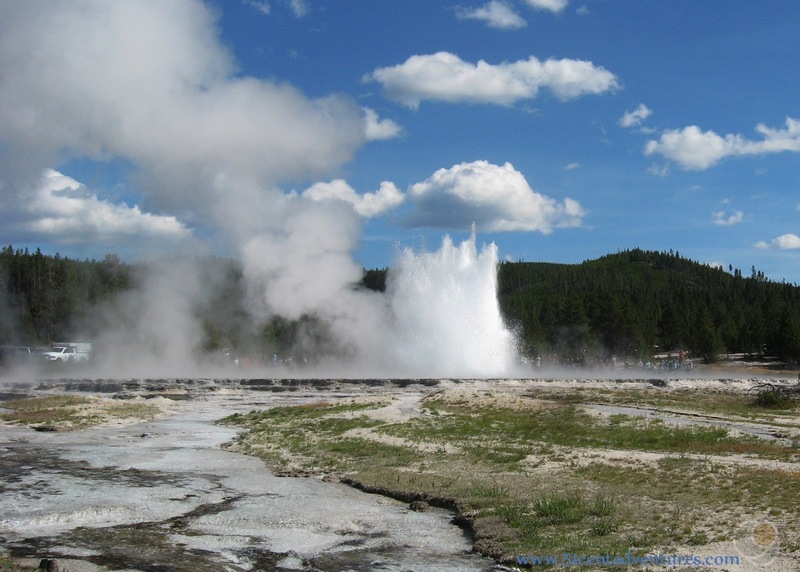 There are also apps that track eruptions for some of the most predictable geysers in the park. In addition to being predictable, this geyser is also delightful to watch. It's a fountain geyser which means it shoots up water at intervals rather than one long continuous stream like a cone geysers. Watching cone geysers erupt is fun, but honestly the show gets kind of old after a few minutes. With fountain geysers you never know how high the next burst of water will go. I knew I wanted to watch Great Fountain Geyser erupt at least once during our summer in Yellowstone. 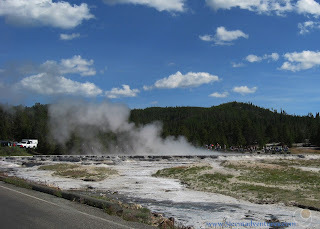 One day, on our way back home from Lone Star Geyser, we drove by the Firehole Lake Drive. On a lark I told my husband that we should drive down there, and see if Great Fountain Geyser was going to erupt soon. We'd driven by this geyser before with no luck. When it's not erupting its just a large pool of calm water. On this day we saw the usual pool of water, but there were cars lining the road around the geyser and a crowd of people was waiting by the side of the geyser. Obviously people were expecting something to happen soon. Predictable geysers in the park have dry erase board signs near them where park employees post expected eruption times. When we got near the sign we could see that it said that the geyser was scheduled to erupt sometime between like 2:00 pm and 5:15 pm. We got there at 4:50. 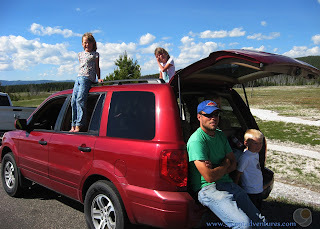 We liked the odds of seeing this geyser erupt so we found a parking spot and sat back to wait. There were benches near the geyser, but they were in the sun. We preferred to wait in the shade of our car. We didn't have long to wait. Within 5 minutes the pool started churning and sending up small shoots of water. Soon huge pillars of water were shooting into the air. It was amazing. Just when we thought the geyser was done it would shoot up even taller pillars of water. The geyser reminded me a lot of the fountains at the Bellagio in Las Vegas. I struggled to comprehend that this eruption was completely natural. There were no man made pipes or pumps forcing this water to behave this way. It was just nature. Watching Great Fountain Geyser erupt was one of the best moments during my whole summer in the park. This is my favorite geyser. Recommendation: I highly recommend, even urge, you to take time to watch this geyser. 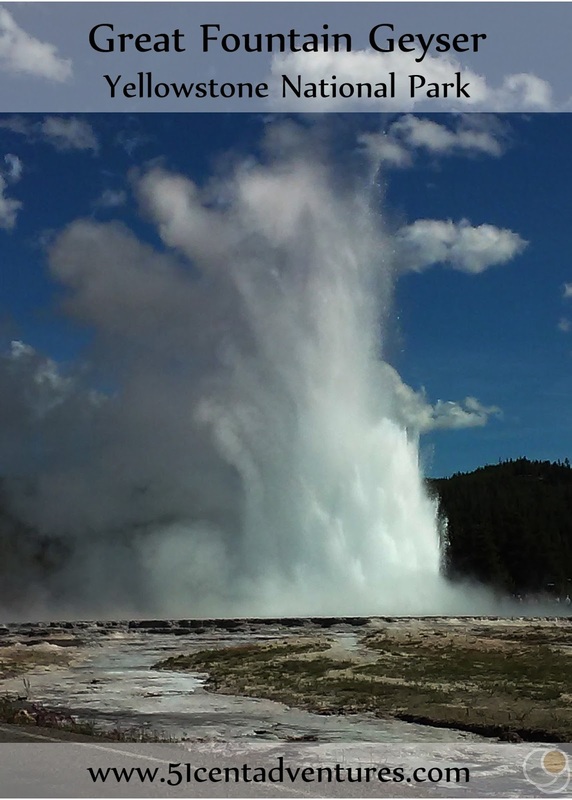 Check with the Old Faithful Visitor Center or a geyser prediction app to find out what time the geyser will erupt. Then bring some shade and plenty of water and get ready for the best show you'll see in Yellowstone. 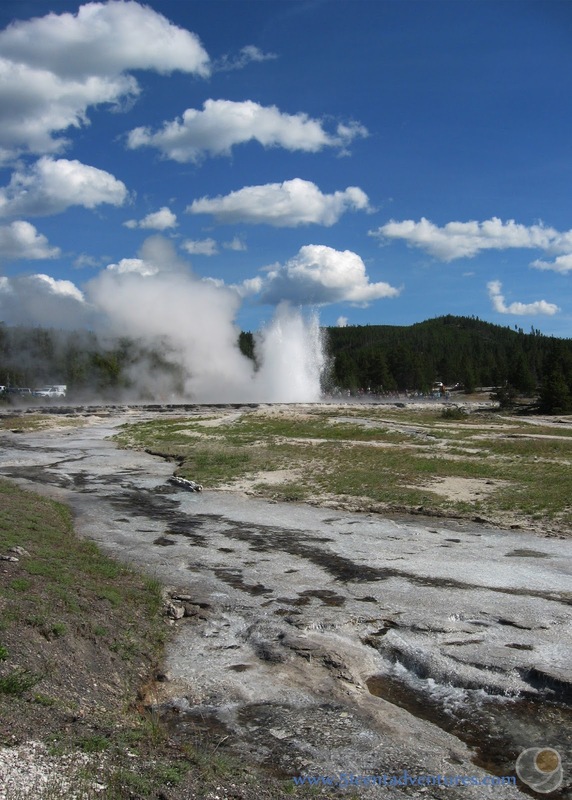 Directions: Great Fountain Geyser is located in the Lower Geyser Valley along Firehole Lake Drive. Which is on the western side of the lower loop of the Grand Loop Road. The entrance to Firehole Lake Drive is just south of the parking lot for the Fountain Paint Pots area. Places Nearby: White Cone geyser is just a short walk from Great Fountain Geyser. And really all of Firehole Lake Drive is really interesting. 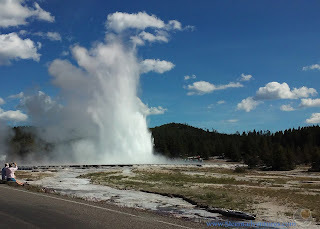 There is a parking lot about a mile away from Great Fountain Geyser. There are some little board walk hikes around Firehole Lake. This area doesn't fill up with tourists as fast as the other geyser areas in this part of the park. So it's a good place to go if you are having trouble finding parking. Want more Yellowstone Vacation Ideas? Check out my list of Things you can't miss and hidden gems along the way. I would love to hear what you think. Did I get it right, or was I dead wrong? What was your experience like? Have a question or comment? E-mail me at 51centadventures@gmail.com. Visit Valerie (51 Cent Adventures)'s profile on Pinterest. Travel theme. Theme images by bopshops. Powered by Blogger.